I purchased these pillows because of the great reviews: Theres lots of good reviews, and some bad reviews. Seemed like theres only a handful bought "bad" pillows so I took a chance and purchased it anyway.. The pillows look great once its in a case and on the bed. I couldve sworn it was described as firm, but as I lay my head on it, my head falls straight down to the bed. No support! Its tooooo soft. As for the "gel" description: it seems as if its regular "fill"..Nothing fancy. I guess I was naive enough to believe that the "gel" was that comfy jelly fill stuff. Slept on it for 1 night, and ended up switching back to my old pillows in the middle of the night. These will only be used for the decor pillows now. When they arrived...2 king sized pillows arrived in a box that looked like it held one standard size pillow, so right away I thought no way, they sent the wrong thing...but they blew out of the box when i opened it, and then I figured they were supposed to be "extra firm"...how could they be? Well, they are, and they don't lose their shape. Amazing pillows. Tried everything else, so i figured why not try gel? Well, I wasnt disappointed! I really like them. I like firm pillows but don't like when they hurt your head...these don't do that...they are firm AND soft, if that makes sense. So, they are quite comfortable. I would highly recommend them!!! I think these gel filled pillows are great. Before buying, I read some reviews that complained about the pillows being too soft and that you sink in too far. I've found out that the pillows do sink in a bit, but I find that comfortable. I guess that's personal preference. I would recommend buying these pillows and if you don't like them, put them in a guest bedroom. I'm gong to buy some more. They are very compressible. I think I can squeeze one of these into my overhead bag when I travel. These pillows are much better than most hotel pillows. We bought these pillows to use with two king sized pillow shams, and they work great. They fill the sham completely and hold their shape, even after we have used them. They are soft, but the gel is very comfortable. I would recommend them. Nice king pillows but a bit heavy and too fluffy to sleep on comfortably. Good for shams or decorating, but not the perfect pillow for sleeping. This is the 2nd order I have had. The pillows are just perfect for my likes. The pillow looks firm and full in the pillow case on the bed. But when you lay on it , it is soft and adjusts to your head. I love these pillows. Good pillow for a back sleeper! My husband is a back sleeper and finds these pillows soft yet firm at the same time. I am a side sleeper who sleeps with my arm under my head and find that when I try to use this pillow it makes it too high for my neck, and can not sleep comfortably. I have tried to change positions but due to a shoulder injury I find that is the best position for me. 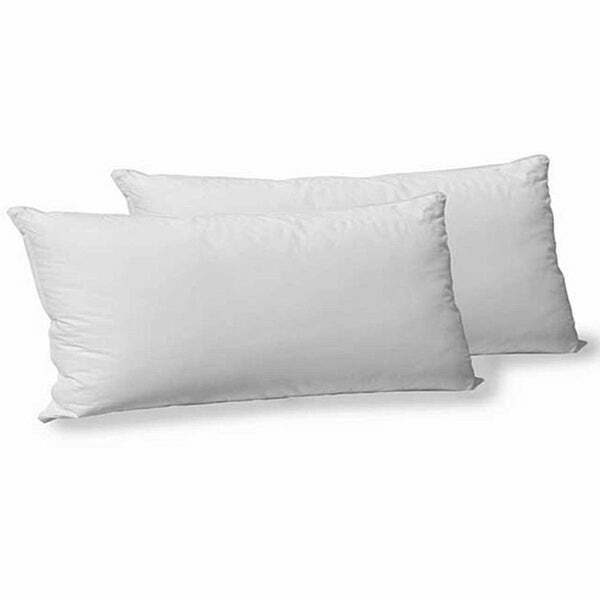 These are great pillows, fill out the pillow cases nicely but would not recommend if you are a side sleeper that is used to a pillow with a lot less fluff! Overstock is wonderful and shipping time was extremely fast and even though these are not comfortable for my sleeping habits I would buy them again for my other beds! I was a little disappointed in that they are a little too billowly. I had hoped that they would be firmer,, fluffy. However, they stay nice and cool. I did a lot of research on pillows before purchasing these pillows. I replaced all my bedding as we purchased a new bed. I am very pleased with the quality of the pillows, they are as they were described on the website, and we are both very happy with this purchase. The price was extremely good on top of everything. I have had nothing but good service with my dealings with Overstock.com. I have already recommended the pillows and website to several people and will continue to do so. Thanks for providing the good products and service at great prices. Keep up the good work. I am never going back to regular pillows after using the gel-filled. These pillows are uber-comfortable. They don't get flat...just always comfortably plush. I would recommend these to anyone. Great value! I've had these pillows for over a month now. They are excellent.Seems funny to be excited about pillows,but they actually help me sleep better.They do not go flat ! Highly recommend ! I had these shipped to my son. He loves them. He says their firm and always cool. Great pillows!! Had them for awhile now and still love them! Absolutely the best purchase I have ever made! Sleeping with these pillows is heaven on earth! Received this pillows and as soon as I opened the box, they plumped right up. Super comfortable. And I appreciate that they were put together in the USA, employing Americans! Very soft and comfortable. I read some negative reviews, but was glad that I purchased them. I have some neck and back issues and I slept quite comfortably. Very comfortable pillows. So glad I ordered these. love length of pillows but they were not as firm as I wished. "How long do they keep their fluff"
We have had ours six months there still great. They have a cool temperature feel to them. I needed two king size pillows and wanted to try these based on the amount of good vs bad reviews and the comments in those good reviews. I returned pillows that were just too firm. Needed king pillows for the new bed. I love the Gel filled pillows. "There are 2 options when purchasing this item. What is the difference in he options?" Hello fldngbt, one of the options is hypo allergenic memory foam. Thank you for shopping with us!